The programme enshrined in this disc was made over four evenings which marked the tenth anniversary of the St. Ephraim Male Choir. The location was Budapest’s St. Stephen’s Basilica and each evening took place on an important ecclesiastic festivity date according to the Orthodox Christian calendar. The organisational principle involved was one that showed the rich variety of the Byzantine tradition, and thus to transmit the religious atmosphere of the concerts. To ensure that the true experience is projected, and not one that has been sanitised, the quasi-liturgical nature of the evenings have been left intact – there has been little (if any; the notes aren’t totally clear) retakes or post-concert tidying up. The guest performer was Evgeny Nesterenko and from the more folkloric strain comes Márta Sebestyén, who is well-known from her many discs and concerts. Both contribute to two pieces. The music ranges from classic Orthodox prayers to contemporary pieces and invokes rite through a sequence of Bell prayers, which are interspersed throughout the disc – these are brief episodes for deft tintinnabulation. The resonant basilica acoustic is a most appropriate location for the choir’s deep, rich bass extension. Whether in contemplative music or such as the joyful Mussorgsky setting of The Angel Cried to the Lady, Full of Grace their reputation suffers no harm. They sing a setting of Christ is Risen from the Dead in three languages – Hungarian, Greek and Old Slavonic and are superbly sonorous throughout, with crisp dynamics, even in the billowing acoustic, and fine articulation. 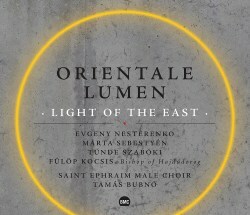 Sebestyén contributes her distinctive vocalism to the Moldovan-Hungarian fokloric Today Christ is Risen. In a setting of the Vespers of Dormition replete with Eastern Modes, both Eastern and Greek music is chanted side by side and there are two solo singers representing each tradition. Both are impressive enough but with the throbbing drone effects the whole performance is a study in living tradition and spiritual intensity. Rachmaninov’s brief Hexapsalm is beautifully done and the final piece, a deep, dark ballad called The Twelve Thieves is sung with riveting concentration by Nesterenko. There are unfortunately no texts or translations. It would probably have required quite an extensive booklet given the variety of languages involved and the necessity to translate them into more than English. However if one submits oneself to the unfolding nature of the music, one can enjoy its inspiring depth and breadth in this compelling disc.